ARCHIE is a research project in which the educational staff of the Gallo-Roman Museum collaborates with the Human-Computer Interaction research group of the Expertise Centre for Digital Media (Hasselt University) in the context of the expansion of the museum. The starting point of this interdisciplinary collaboration is our strong belief that handheld guides are a promising medium to enhance visitors’ learning experiences in a museum and strengthen the experience of a group visit. In this paper we present a first application: a collaborative trading game for (school)groups of children; from conceptual stage towards final implementation and conclude with user test results. We designed the museum game so that every player is dependent on the concrete actions of other players; only through social interaction and cooperation can they come to a good result. The use of a pocket-sized computer in a museum as a tool to enhance the visit experience has found its way into many museums over the last five years. Science centres, heritage institutions and contemporary museums like Tate Modern in London, the Marble Museum in Carrara, the Exploratorium in San Francisco, and Torre Aquila in Trento have been experimenting with mobile applications. For a state-of-the-art and more detailed review of mobile applications in museums and cultural environments, see Proctor & Tellis (2003), Raptis et al. (2005), and Linaza et al. (2006). Pioneers of multimedia guides are still exploring the best ways to make use of them, but meanwhile there is already some consensus on the strengths and pitfalls of PDAs. First of all, PDA technology allows the dynamic presentation of information without disturbing the physical space of the exhibition and not limited by the aesthetics of the gallery. Secondly, handheld devices enable visitors to browse information at their own pace and according to their own interests. And last but not least, they give scope for offering something entirely different from a conventional label; namely, a wide range of content and media, putting sound, photos, videos, text and interactive games in the palms of visitors’ hands. Starting from these advantages, screen-based multimedia guides can be welcome additions to the visitor experience. However, the first PDA-based applications in museums also revealed some important shortcomings. The device demands a lot of attention. It generates the unintended side effect that it is quite an individual experience, and thus it isolates visitors from one another (Vom Lehn & Heath, 2005; Vom Lehn, Heath & Hindmarsh, 2005; Angliss, 2006a, 2006b). With the ARCHIE project, we want to deal with these negative side effects and explore the different possibilities a mobile museum guide can offer in the future: greater versatility for visitors to get information tailored to their needs and interests (personalization), the opportunity to discover the exhibits at their own pace (localization), and stimulation through social interaction among family or group members (communication). the potential of the learning environment and its objects largely depends on the social atmosphere generated and the support young children receive through positive, reciprocal interactions. […] The successful learning setting functions as a community of learners, where all individuals are respected, their learning is supported, and opportunities for collaboration are provided (Piscitelli & Weier, 2002, p. 126). Though the research on social interaction and collaboration using new technologies is quite recent (Hawkey, 2004), there are already some projects on museum co-visiting. The Sotto Voce project developed an electronic guidebook prototype that promotes interaction between museum visitors through content and audio sharing (Woodruff, Aoki, Hurst & Szymanski, 2001). This study resulted in an interesting set of design principles, but the collaboration between companions is rather passive (following or checking in tasks). The goal of the Cicero Project (Laurillau & Paternò, 2004) – to promote social interaction between visitors through cooperative and educational games – fits in with our project. Also the reported findings of the user tests of the ‘Mystery in the Museum’ game in the Solomos Museum are very interesting (Cabrera et al., 2005). However, we hope to take the idea of a collaborative learning activity one step further than the above-mentioned edugames which are still to be played at a quite individual level with only a shared enigma. In collaboration with the museum team of the Gallo-Roman Museum, we decided to develop a prototype of a learning activity for (school) groups of children 10-14 years old. These youngsters are one of the main target groups of the museum. Extensive visitor research the museum organised in 2005 pointed out that they have an especially strong interest in multimedia and games (Provincial Gallo-Roman Museum, 2005). Therefore, a collaborative museum game on PDA can be a perfect means to support a museum visit for these young people. With this first application, we want to verify the usefulness of the service and test whether it supports our goals. The human-centered design process should start at the earliest stage of the project and should be repeated iteratively until the system meets the specified requirements (International Organization for Standardization, 1999) – see Figure 1. Extensive user analysis and constant evaluation are typical activities in the User-Centered Design process, and they also played important roles when we designed our prototype. Our process consists of 6 phases we believe to be important for future designers (see Figure 2). Some steps may seem new and others are may be over- emphasized, but in the end it is the same story as the ISO standard: analysis, design, evaluation and numerous iterations. Concerning the borderlines between the different phases of the design process, it is wrong to suggest every phase has a clear beginning and end: rather, they blend into each other and are repeatedly evaluated. In the context of future expansion, the Gallo-Roman Museum conducted an extensive investigation among its visitors and potential visitors to find out what prompts them to visit the museum, what their interests are, and how they want to learn about the collection (Provincial Gallo-Roman Museum, 2005). The results of this visitor research were used to provide us with profiles, visit expectations, learning styles, visit behaviour, and preferences concerning information and presentation for the main target groups. One of these target groups is the ‘auto-active experiencers’, aged between 10 and 14, who visit the museum with their school. They like multimedia and computers: they also like them in museum presentation. As their name points out, their main expectation is to experience the museum and relax, have a nice day out. Their ideal museum is an amusement park. They also have a strong need for hands-on activities, and they like to map out their own routes according to their interests. However, these youngsters prefer an autonomous visit: hanging around with (groups of) friends is really important for them. Besides the contextual information of the target user we obtained through the visitor research, we also conducted a focus group (Preece et al., 2002) of youngsters (4 boys and 2 girls, aged between 12 and 14 years). The main reason was to get better acquainted with their needs and expectations towards a museum game. First, we invited them to think aloud about gaming in the museum, and confronted them with possible consequences, (dis)advantages, practical issues, … Then we observed them while they were testing our previous demo (a PDA tour to the Neanderthal man exhibition). This gave them the chance to think more concretely about a museum game on a PDA platform and give some feedback (see Figure 3). integrate a help menu within the game (they do not read the manual in advance: they just start and ‘find out’). Starting from the results of the user analysis, we decided to work on a specific chapter of the future museum exhibition concerning the introduction of social differentiation in West European society (around 825 BC). The main message is the introduction of iron objects and salt as a seasoning in daily life. This results in new exchange networks with the Hallstatt region (South Germany and Austria). Ambitious individuals from the local population emerge as key figures in these contacts and start to form a socially distinct elite class. It is really important to take some time to consider attentively the main idea or message of the exhibition, because the presentation (and also the PDA tour) must directly reflect this (Katz et al., 2006). We decided that every player had to have an explicit role in the game: there are three farmers and one leader. Each one has individual properties and specific goals that need to be achieved. By solving questions or playing little games, farmers have the possibility of gaining or augmenting their exchangeable goods (local products like cattle, sheep …). The leader has an overall view of the earned exchangeable goods of his farmers, and only he can make them a trade proposal. The leader also has exclusive contacts in the exchange networks: he can travel to the Hallstatt region three times during the game to exchange local products for iron objects and salt. While every farmer has as a goal obtaining a specific amount of iron and salt, the leader’s objective is to keep every farmer satisfied (this means making sure that every farmer obtains his goals) and to get hold of a bronze sword. The game is designed so that every player is dependent on the concrete actions of other players; only through social interaction and cooperation can they can come to a good result. The main message is to learn in an unconscious way about unequal stratifications in society: how they came into existence, how they worked, and more precisely, how it must have felt to actually be in an unequal position. With the scenario written down, we started to create a user task model: this is a scheme which maps out all possible user actions and activities in each stage of the game (Mori et al., 2002). User task models are frequently used to specify requirements for an application from a user’s point of view. These task models allow gradual refinement of the high-level tasks and goals into fine-grained actions and activities. This structured description gives input to a more specific storyboard which includes user needs, functional information, and all aspects of the UI: buttons, navigation, actions, etc. 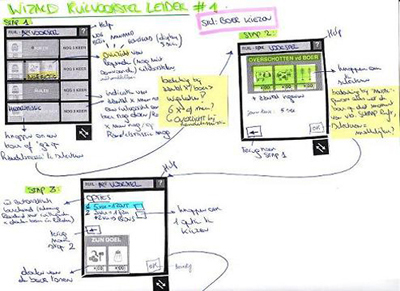 The storyboard also contains the first mock-ups of the user interface (low-fidelity prototyping) created by the designers using information from the scenario and user task model (see Figure 4). During conceptual design, ideas of the concept generation phase are constantly evaluated on feasibility. For example, in the first scenario we had the idea that in the last stage of the game the leader should manually distribute the iron objects and salt among his farmers. But while we were working on the user task model, it soon became clear that this would take too much time from the leader. Because this is not interesting for the other players, we decided that the distribution of iron and salt should happen automatically when the leader returns from the Hallstatt region. The storyboard also quickly reveals possible problems and difficulties for programming the game. During the next phases, the low-fidelity prototypes of the user interface will gradually evolve towards what is called high-fidelity prototypes, the concrete and final user interface. Once the functional requirements for the system had been specified, we started to think about the overall software architecture. This resulted in the ARCHIE Mobile Guide System which consists of a set of three core services (personalization, localization and communication) on top of which an arbitrary interface shell can be deployed (see Figure 5). The core services are in fact proxies that communicate with a central server containing a database of visitor profiles, visitor groups, artefact locations, etc. Although an interface shell can make use of the different core services, it can be developed quite independently; it only has to handle events sent by the services it is subscribed on. 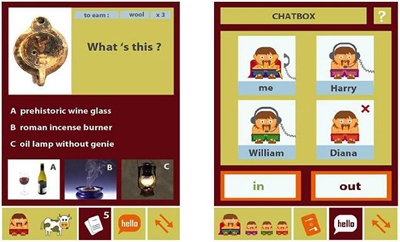 This approach results in a flexible mobile guide system rather than one particular mobile guide: various interface shells that behave differently can be developed, and by using the communication service which handles the interaction between visitors, it is possible to implement collaborative applications such as games. The trading game is actually an interface shell that is developed on top of the ARCHIE framework and makes use of its several core services. The localization service is used for determining when the game has to be started; namely, when all team members are nearby the physical presentation of the particular museum narrative. This is realized by catching and interpreting the events from the localization service. This service makes use of the wireless network to determine the location of the visitor. Personalization is realized by assigning each team member a specific role – farmer or leader – and by providing each person with an individual adaptable character (avatar). The communication service makes it possible for team- mates to communicate directly with each other through a chatbox. They can use this Voice-over-IP-based communication channel to negotiate or comment on the trade proposals and/or to help each other solve the questions. An indirect communication style allows visitors to exchange other types of data and is carried out by the trade actions which are necessary to accomplish the game. By sending a trade proposal to a farmer, the leader initiates indirect communication. The farmer replies by accepting or refusing this trade proposal. The data that is exchanged between the players is obviously game related. A good architecture partitions the system’s present and foreseeable requirements into a set of loosely coupled subsystems with each a high internal cohesion (Larman, 2004). Low coupling improves the ease of development, and software changes in one module will affect fewer other modules. High cohesion is achieved by grouping similar tasks in one module. The ARCHIE Mobile Guide System fulfills these requirements. Changes in one of the core services do not demand change in other core services, and new services can be easily added. Also, creating new interface shells does not require a new software structure since there is no hard binding between the interface shells and the core services because of the event bus interface. Once the system architecture is clearly defined, implementation can be started. When the scenario and storyboard are ready, and computer scientists have started the implementation of the game, it is possible to start focusing on the concrete content development. It is possible to argue that this stage has already started during or after the concept generation phase, because deciding on the main message of the exhibition, the game, rules of play, etc. can also be interpreted as content development. Again, the borderlines between the different phases of the design process should not be seen as strict. It is important to take time to decide what topics, exhibits, angles of approach, and type of questions the PDA should take care of. This exercise helps to analyse the content and show how it can clarify, summarize and/or emphasize the main idea of the exhibition. This analysis is also important to get a clear view of a visitor’s (possible) understanding and participation throughout the exhibition. The content should be catchy enough to trigger the visitor to extend and go deeper into this virtual visit without neglecting the surrounding exhibits. This brings us to an important design issue: the information balance. In a museum environment, there are multiple entities that deliver information to the visitor ( museum exhibits, companions and in this case, the PDA). To manage the constantly changing demands of these entities, each visitor performs a sophisticated balancing act (Woodruff et al., 2001). The mobile guide should help visitors balance their attention in a natural way and therefore maximize their enjoyment of the visit. And in all ways, the content developer should avoid possible information overload. Concerning interface, media and content, we developed some guidelines or sensitivities that can help the content developer and user interface designer to create an interactive handheld guide that fits appropriately into a visitor’s desired experience. These sensitivities underline critical issues that should be considered while designing in order to encourage interaction between visitors and the museum. Note the following suggestions. Keep it consistent, intuitive and clear. Provide a short introduction to all the buttons and functions. Make it work with a selection menu that lets the visitor remain in control of the information delivery. Visual selection (of objects) is preferred above entering numbers. Present information in small, easily-digested snippets: captions, sounds, videos and photos are preferred. Choose audio presentation of descriptions rather than written paragraphs. Keep text on screen to a minimum. Keep audio and video clips short (30-40 seconds maximum). Avoid playing audio while showing text on screen at the same time . Encourage visitors to look (more profoundly) at the exhibits (for example, zoom into details). Direct the visitor’s gaze by use of spoken instructions and low-key animations on screen when it’s time to look at the real object. Stimulate comment and discussion about the exhibition. Provide hardware and content for retrieval by two persons or more. The trading game we were developing includes an introductory movie (with audio) and a set of 20 multiple choice questions about museum exhibits (including images). The introductory movie is a flash animation which runs for one minute. It provides some background information on the game and a very short explanation of all 4 buttons. The audio captions consist of very short sentences, on average 10-12 words each. Most of the multiple choice questions are introduced through an image of a museum exhibit and the direction, ‘Look for this object’. Once the museum object has been found, the visitor continues to answer the questions. It is also possible to visually select one of the multiple answers by clicking on an image-button. Text on screen; for example, the multiple choice questions and the explanations within the help menu, is kept minimal (sentences with 5-6 words on average). We use a clear and readable font, with enough contrasting colours. The overall user interface is uncomplicated and consistent, and the use of buttons (back, next) and wizards is intuitive (see Figure 6). This last phase is probably one of the most important steps within the design process, and unfortunately it is also the one most often neglected. Designers quickly assume that if they and their colleagues can use the software and find it attractive, others will too. Furthermore, they prefer to avoid evaluation because it adds development time and costs money. But without evaluation, designers cannot be sure that their software is usable. Although there are many definitions and many different evaluation techniques (Preece et al., 2002), we decided to involve the future users directly to check whether their needs are being met. In a first iteration, we organised an informal initial evaluation of the first workable prototype. We asked some colleagues (both software development experts and users with no experience in software development) to try our first prototype (which did not contain images, nor the introduction movie at that point) and give some feedback. This internal evaluation quickly revealed some errors, problems, inconsistencies … and gave us a clear view of what had to be changed to make the interface more usable and intuitive. Three weeks later, after the prototype had been adapted according to the recommendations of the informal initial evaluation, we visited three secondary schools in and around Hasselt (two general schools and one technical). In all cases, our contact person at the school was the history teacher who arranged some time (during class or lunch break), space (a class room that simulated a museum gallery – posters of museum objects were placed on the tables) and groups of students (8 students per session) to test our prototype. First, we gave them a short introduction to the ARCHIE project and asked if they were familiar with the Gallo-Roman Museum. Because the museum is well-known in the region, almost all students had already visited it at least once. We divided the 8 students into 2 groups of 4 players and handed over the PDAs. During the test the students were observed (see Figure 7), and afterwards they were asked to fill in a questionnaire. This consisted of 20 questions concerning both personal background, and the usability and playability of the trading game. Because it is easier to process specific answers that can be categorized, we worked with multiple choice questions and Likert scales. There was only one open ended question in the end: ‘Do you have other ideas or remarks?’ Besides the observations and questionnaires, we also logged user actions on the PDA. In total, 68 school children between 11 and 15 years old participated in the usability test (55% aged 13 years). More boys (75%) joined the tests; this follows from the fact that the largest part of the usability tests was held at the technical school (where in terms of percentage more boys attend). Further test results, however, did not indicate any difference between boys and girls. As expected, all the young people were extremely experienced in ICT. On a daily basis, 78 % have access to a PC, 76 % use the Internet, and 63 % own a mobile phone. They frequently play computer games and chat with friends. A PDA is the only medium they do not know well, but this does not mean they have problems using it: 82 % say it is very easy to use. Concerning the trading game, all students found it very funny and nice to play. Although we told them that it was just a prototype, their only remark was that the game should last a bit longer. Also the chatbox service was positively evaluated: they really liked it, found it easy to use, and 88 % would certainly use it during a museum visit: ‘to stay in contact with family and friends while they aren’t nearby’, ‘it’s nice and handy’, ‘to pass information’, ‘it’s an amusing way to learn something new’ … They are also very positive about the idea of a PDA as a museum guide, because ‘it’s more fun’ (85%), ‘I can map out my own route’ (40%), ‘I understand things better’ (30%), and ‘it’s more informative’ (20%). Our general conclusion about the usability tests is that young people are enthusiastic about the PDA medium: they only want more of it (more questions, more possibilities to adapt their avatar, etc). One of the standard questions they asked us after the usability test was, ‘When will it be installed in the museum?’ Another was, ‘When will you come again?’ The application also seems to support our goals: observations confirm that the trading game provoked collaboration and lots of social interaction among its players, and there was also a good balance between looking on screen and looking around. The questions stimulated the students to look around and examine the museum objects (in this case, the images on the posters). It is notable that young people do not read text on screen, nor listen to very long audio captions. A good example is the introductory movie: all participants indicated the movie is clear, but our observation confirmed that they just watched the movie without listening. Another example is the chatbox: some students asked us how they can use this service even though the directions for use can be read on the screen. It is really important to make the screen more visually appealing; for example, by placing text in balloons, by making lips move when a character is telling something, by working with multiple voices/dialects, etc. ARCHIE is an interdisciplinary research project which aims to discover how a handheld guide can be used to enhance the museum learning experience. Because we stress the important role of social interaction as a prerequisite for intellectual, social, personal and cultural development, one of the main objectives of the ARCHIE project is to encourage and stimulate interaction both with the museum and with fellow visitors, using the PDA as a communication medium. We have developed an initial application that incorporates the concepts discussed in this paper: a collaborative trading game. The design process that leads to this prototype consists of 6 steps: user analysis, concept generation, conceptual design, architectural design, content development and evaluation. User tests pointed out that the objective of social interaction has been accomplished and that the PDA enhances user experience significantly. The ARCHIE mobile guide framework that was used for the trading game is currently being extended so that more complex museum visits (e.g. an overall museum game for different types of groups) can be supported. Part of the research at EDM is funded by ERDF (European Regional Development Fund), the Flemish Government, and the Flemish Interdisciplinary Institute for Broadband Technology (IBBT). We would also like to thank Mieke Haesen for her help with the evaluation process, the museum staff of the Gallo-Roman Museum for close cooperation, and the secondary schools O.-L.-Vrouwlyceum (Genk), Middenschool Kindsheid Jesu (Hasselt) and Technisch Instituut St.-Lodewijk (Genk) for evaluating the software discussed in this paper. Angliss, S. (2006a). “Talking sense”. In Museum Practice Magazine, 34, 46-47. Angliss, S. (2006b). “Sound and vision”. In Museum Practice Magazine, 34, 51-52. Falk, J. & L. Dierking (2000). Learning from Museums: Visitor Experiences and the Making of Meaning. Walnut Creek: Altamira Press. International Organization for Standardization (1999). ISO 13407. “Human Centred Design Process for Interactive Systems”, Geneva. Larman, C. (2004). Applying UML and Patterns: An Introduction to Object-Oriented Analysis and Design and Iterative Development (3rd Edition). Prentice Hall PTR. Laurillau, Y. & F. Paternò, (2004). Supporting museum co-visits using mobile devices. Proc. of MobileHCI 04, Berlin: Lecture Notes in Computer Science, 451-455. Retrieved November, 2005, from http://giove.cnuce.cnr.it/pdawebsite/CiceroPublications.html. Linaza, M.T., A. García, A. Susperregui, & C. Lamsfus, C. (2006). “Interactive Mobile Assistants for Added-value Cultural Contents”. In: M. Ioannides, D. Arnold, F. Niccolucci & K. Mania (Eds.) Proc. of VAST 2006. Aire-la-Ville: Eurographics Association. 83-90. Morrissey, K.A. (2002). “Pathways Among Objects and Museum Visitors”. In S.G.Paris (Ed. ), Perspectives on Object-Centered Learning in Museums. Mahwah: Lawrence Erlbaum Associates, 285-299. Mori, G., F. Paternò, & C. Santoro (2002). “CTTE: Support for Developing and Analyzing Task Models for Interactive System Design”. In IEEE Trans. Software Eng. 28( 8 ). 797-813. Piscitelli, B. & K. Weier (2002). “Learning With, Through, and About Art: The Role of Social Interactions”. In S.G.Paris (Ed. ), Perspectives on Object-Centered Learning in Museums. Mahwah: Lawrence Erlbaum Associates, 121-151. Preece, J., Y. Rogers, Y. & H. Sharp (2002). Interaction design: beyond human-computer interaction. New York: John Wiley & Sons, Inc. Provincial Gallo-Roman Museum (2005). Quantitative learning target group research. Unpublished findings, Tongeren. Raptis, D., N. Tselios & N. Avouris (2005). “Context-based design of mobile applications for museums: a Survey of existing practices”. In Proc. of MobileHCI’05. New York: ACM Press, 153-160. Redmond-Pyle, D. & A. Moore (1995). Graphical User Interface Design and Evaluation. A practical process. Harlow: Prentice Hall Pearson Education Limited. Vom Lehn, D., & C. Heath (2005). “Accounting for New Technology in Museum Exhibitions”. In International Journal of Arts Management, 7(3), 11-21.